The reason that this cookbook is so small is because I do not publish any recipes that include alcohol in the recipe. 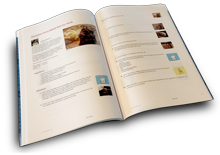 Order a professionally printed, perfect bound cookbook with a full color glossy cover and 32 recipes. Miss Nancy - I pray that GOD will Bless You beyond measure. I applaud your dedication and your convictions. May God bless you and yours..
Miss Sofia, please do copy and enjoy the recipes & also please keep in touch. A great collection of recipes and many that I may copy But I am attempting to stop collecting recipes It's a habit and I know it but I have given on smoking and drinking and also collecting recipes!!! They are taking my life away and nothing is left!! Oh yea, I will be healthy but a sad lonely great grandma!! !